Most people would think of Berlin as a place for independent art projects (kunstprojekte). 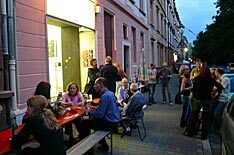 Frankfurt however has shown more activity based on the number of inhabitants and artists in general. The work of self-organized, sometimes artist run spaces and projects dates back to the early 90s. The peak of this movement was reached from mid to end 90s with some 20 projects operating in Frankfurt and Offenbach. An economical decline after the boom 80s forcing galleries into a retreat and public institutions into rethinking of their practice, focusing on partnership with companies, with the result in a more mainstream art, like painting. An underdevelopped galleries's system in Frankfurt. The single sided selection criteria of figures like Kasper König or Jean Christoph Ammann, leaving lots of young artists out of focus. at all in Offenbach, the neighbourtown of Frankfurt, with its artschool Hochschule für Gestaltung, leaving their graduates from fine art classes nowhere to go. More and more artists "on the street", without representation. Self-representation as a solution. But not in the 70s model of "Produzentengalerie" (producer's gallery), but new forms of mixing art, music, business and club culture. First coined by Bauhaus Dessau as "New Entrepreneurs" in 2001, Creative Class by now. From mid 90s an enforced influence of clubculture has become visible, especially supported by groups from Offenbach (Fahrradhalle/Peak Club). DJs become artists and vice versa. Frankfurt stages the first nightly streetparade ("Nachttanzdemo") in 1995, a politically motivated demonstration against the repressive policy of the City of Frankfurt in matters of nightlife, clubs, warehouse parties. Borders between art space and club become blurred, with new forms in between. Das Bauhaus Dessau hat im Jahre 2001 Untersuchungen über alternative Kulturmodelle in Frankfurt angestellt. Die Ergebnisse dieser Studien finden sich unter "Cool Frankfurt"
The Bauhaus Dessau foundation has published studies on Frankfurt art-spaces and other "off"-cultural phenomenon on their page.